Use photo archive box: Use a good photo archive box and envelope to manage and store photos as well as their negatives. Label photos: Label each photo and make a place for it in the photo archive box. Follow a common and easy label system so that not only you but also anybody else can understand them. Keep scan copies of original photos: Use a professional photo scanning service to scan original photos and keep them in digital format. It helps in managing and distinguishing photos by seeing their digital copies. Make photo scrapbooks: Select good themes and make chronological scrapbooks. 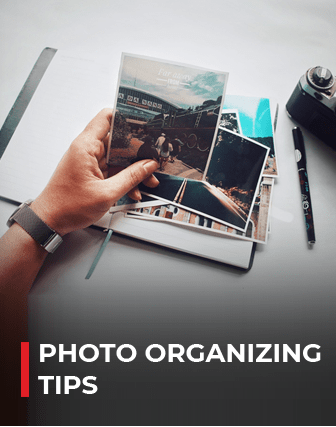 This is not only an attractive means of storing photos, but it helps in going through an entire event, even after years. Avoid adverse atmospheric conditions: In order to avoid degradation of photos, you must avoid places with high humidity and temperature. Moreover, it is always suggested to use quality products give your photos a longer life. Choose a reputed photo organizing software: A quality photo organizing software always comes with a lot many great features to store photos effectively. In Mac you can use iPhoto, whereas for Windows ACDSee is a good one. For professional use, select good photo editing and storage software: Professional photographers with large collections must opt for quality photo storage and editing software like Aperture (Mac) or 'Adobe LightBox' (Windows). Write extra information in Meta tags: In the Meta tags of your digital photos, you can include the GPS co-ordinates of the photography place along with shutter speed, flash, aperture type, and other camera data. Add short phrases to describe photos: In large collection of photos, a short and unique word or phrase helps in easy access of the same. Use descriptive names: It is always helpful to have a descriptive file name of photos and other multimedia files so that they can be identified even from their file names itself. It is always helpful to have a descriptive file name of photos and other multimedia files so that they can be identified even from their file names itself.